The smartphones in your pocket add an extra value to the personality. It acts like, how much smart & high tech mobile phone you have in your pouch, that much you are in good shape. The Google and Apple are the backbones of this smart world of high-end mobile devices; these are not only remained as the best operating mobile systems builder but they are now present newer, upgraded, hi-tech versions of smartphones every couple of months. Google Android launching a variety of new devices with little changes in specifications whereas Apple iPhones always tends to be launched with new tech features that take you to the next level. The iPhones high with amazing functions and cutting-edge technology, and that makes the iPhone one of the best smartphones presently available in the market. IF you are searching for why iPhone is the best or what can an iPhone do that an Android can't or should you get an iPhone or Android then you're at the right page. It really becomes difficult to choose the best and ideal mobile device as per your need. The iPhones came in a year before the Android one and is really ideal for every pocket. Considering the eye catchy mobile handsets filled with lots of features and excellent functionality, iPhones beat the Android. The iPhones are much more capable of performing the higher-end functions than compared to Android smartphones. There is no doubt the iPhones are much attractive than Android phones. They really add value to your personality and makes you stand top of all in the crowd. Its look is more appealing, and it is the first reason that it has become number one choice of the young generation. The most searching term that everyone looks before buying new mobile is "Android Vs. iPhone" and it's really important to know which is better iOS or Android OS. The iPhones are costly, but is it really a good choice to go with iPhone instead of affordable Android devices. 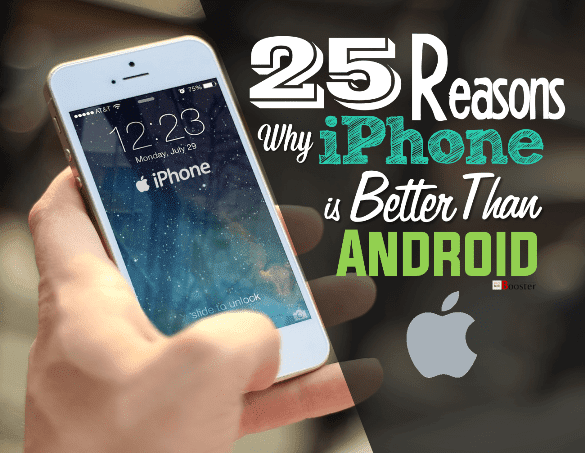 Like these questions, if you are confused while deciding between iPhone and Android, let's check out the other promising reasons why iPhone is still better mobile phones as compared with Android devices. Are iPhones better than Androids? The iPhone always try to bring new things on every launch & offers the latest technology and so leading the mobile industry, so it's nothing going to be wrong if I say no other mobile phones better than the iPhone. It integrates with advanced techniques for better and easier access to the world. The iPhones are new generation’s smartphones. It is, in fact, the gadget with revolutionized technology that every young heart dreams to have in the pocket. As compared to Android phones, iPhones are costlier; but, they are excellent in functionality, flexibility, simplicity, the look, durability, customization and much more. Ultimately, iPhone packs all such amazing features and hence ranking the top of all smartphones industry. 1. The iPhone apps are superior in terms of working functions while Android apps are common and are less popular for advanced functionality. The iPhone apps are recognized as best featured apps including a unique design. An iOS is a platform with the choice of hottest new apps. 2. iPhones are world-known for better hardware as well as software integration. Every new launch of iPhone takes the smartphone to the next level. 3. The sensitivity level of the iPhone screen is ultimate. You can even set the sensitivity level of your iPhone. 4. A unique feature of iPhones comes by its camera featured with an option for "Live Photos." With this feature, the iPhone camera able to captures the audios & videos during as well as just before, and after the shot while capturing the picture. 5. Apple is the first company launches fingerprint sensors with iPhone. Others including Android phones tried with this kind of sensors, but no one is proved as helpful and reliable as the "TouchID sensor" on the iPhone. 6. As compared to Android phones, sharing of photos and videos on Facebook and other social media is much faster. 7. Despite the challenges put by Android, the iPhones are easiest to use. iPhone functions are user-friendly, and it is very easy to operate. 8. If you want to operate the android phone, you first need to learn the same. While iPhones still has zero learning curve. Any age group able to use iPhone features quickly & easily. 9. Apple phones are known for easier 'app drawer' where you can see & move the apps horizontally. This is much easier as compared to Android phones. Horizontal switching offers a wider view of the app which is much easy to use. 10. Apple’s iOS facilitates the quick launch of different apps likes calculator, camera, flashlight, compass, etc. and much more. The speed of launching these apps is very fast with the iPhone. As with Android, iPhone does NOT become slow because of background running apps. 11. When new versions of the iPhone come, you need not require to switch to the next or sell your existing iPhone. iPhones facilitate OS platform upgrade as and when the user wants. The older version of iOS can easily be upgraded with the latest versions of iOS on the same day which takes more time in case of Android devices. This saves you from the great expenses of buying a new handset every time. 12. Apple supports the older versions of iPhones for as long as five years. On the other hand, Google’s Android phones become spoiled in just three years. 13. Switching to a new firmware version for iOS is easy. In a case of Android, new OS usually comes only for new devices and for the old user they need to wait for official updates. But for iPhone, as soon as new OS is launched, every user are able to use it on the same day. 14. The iPhones are appealing and are world famous for better designs and great-looking devices instead of those boring same kinds designs coming with different company labels for Android devices. 15. Apple Pay is yet an important feature of iPhone. With a single click, it is very easy to pay your electricity bills, railway reservations, etc. with iPhone. Apple Pay supports almost all the major credit cards. 16. The services provided by Apple are much easy to understand. You can easily recognize the services & extended support from the Apple. 17. The Reachability feature of iOS is rather very simple and very useful one. Just a double-clicking on the home button, the entire screen shrinks down. If you have any Android phones, you need to click for several times reach the earlier portions of the screen. 18. Newly introduced 3D Touch feature of iPhones offer several new methods to get connected with apps and games physically. The feature is truly amazing. 19. Apple’s iMessage feature turns the boring old SMS messages into the high-end, rich communications. It facilitates to see the other party reading your message. It is possible to send big sized documents. iPhone allows you to add more and more groups and continue conversations. Android phones do not have such a feature. 20. The 'Content Blockers' feature helps you to install apps but blocks all the ads. So, your phone’s memory is saved. 21. Apple offers the best maintenance & guidance to help its users. With the vast database of useful help articles, it is easy to solve any problem related to iPhone. You can get help via live chat too. With Android, you need to rush to the service center or try through online forums or need to wait for replies. 22. Family Sharing feature of iPhone facilitates the user to share the books, apps, photos, and videos. They can be shared on the different mobiles, laptops, tablets, etc. owned by & with your family members. 23. As compared with the App Store, iOS is lacking in the total number of apps, but it's leading with advanced features they provide to the user. The pixel density and the quality of captured photos and videos are great, but in addition to that, slow-motion shooting with 60FPS and time-lapse videos adds more value to your digital age. With live photo feature, the animation of the images during playback is very smooth. This is a very excellent feature of iPhones. 24. With the increase in the depth of encryption, FBI showed the Apple put the privacy & security of the user on top. Your personal information will be in the high-security framework as compared with Android device. And this explains there is no better phone than iPhone. 25. Upcoming feature: HomeKit - It's a smart home platform launching with iPhone, allows you to control the lights, appliances or all the smart devices in your home from your iPphone. The iPhones are really excellent choices as they are packed with the latest technology. Above reasons shows, the iPhones are perfect for every pocket with their unique and attractive designs. No doubt, smartphones are the necessities of every age group with any status you have, iPhone adds prestige to you. With iPhone, you gain influencing personality. In fact, the iPhone is not a mobile but is a revolutionized gadget that provides top-notch features. It is a great gadget that comes with the biggest invention and revolutions. Though iPhones are priced high, I Know, but they still hit the market. These iPhones hold the incredible functionality and characteristic; they are perfect for every smart person.